And we’re back, and on time this time. Kinda. Hopefully. If I finish writing this quickly enough. 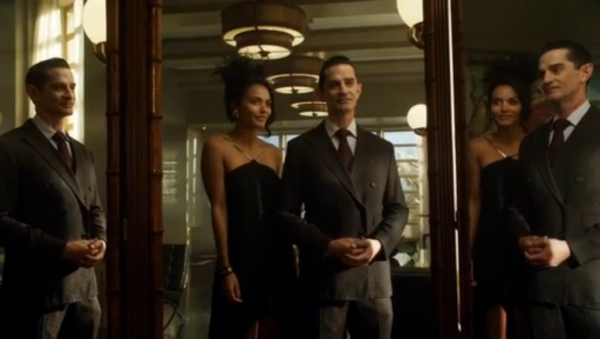 Anyway after hemming and hawwing for a bit, I’m back on board for a while with Gotham, and hopefully it stays this way. There aren’t any characters that are completely aggravating me, and the intrigue is actually intriguing. We’ve got Butch back in business. Kinda. Hopefully. Penguin in full-on gang war with Galavan, and Gordon finally wising up to his ways even if it is a little bit too late. Did this or did this not feel like the fastest mayoral race in history, even if it is supposedly an emergency election? Whatever. I’m still on board. For now. The three sides of Galavan. His public side, his private side, and his true side? Maybe I’m reading too much into it. Even though I completely saw it coming, Penguin finally gets to see his mother free. For about a minute before she gets killed and sends Penguin off the deep end and on the hunt for Galavan’s head. While it’s nice to finally see some real excitement around this place after the relative lull left behind after Jerome’s passing, it still feels a little out of place for Penguin to be this hands on. Then again, I suppose he had a similar methodology when he wanted to kill both Maroni as well as Moony himself rather than let a lackey have at it. It was also a lot of fun to see him pull a Harry Potter stunt with all his men dressed as himself complete with the limp (yes, I know Potter was not the first to do this, just the most present in my mind) I’m also very thankful that Gordon is finally on to Galavan, even though he stupidly let Galavan know that he’s on to him practically immediately after he realized what was going on. And besides the fact that he found out essentially too late. He even points out the show’s own plot hole, or technically plot contrivance where Galavan went from nothing to mayor over the course of a few episodes *ahem* weeks (months?). The Silver St. Cloud angle is slightly more interesting, especially when they toss in a little Cat jealousy. I especially liked Cat’s casual tossing of the “like a slap in the face” line directly at Alfred. I want to say that Bruce is playing along with her, but he hasn’t shown himself to be anywhere near that cunning just yet. Alfred? Maybe, but not Bruce. Not yet. The other big arc in this episode is essentially the birth of the Riddler. Like many things on this show, I’ve been back and forth with how they present the two sides of Nygma’s Riddler personality. I haven’t much liked it when it was the jumpy image or the back and forth camera angle, but I have liked it much more when it was the face in the mirror or just him without the glasses standing off to the side. Cory Michael Smith plays the two roles quite well and gives them distinct personalities and demeanors to make it feel less like Smeagol and Gollum and more like Clark Kent and Superman. Only criminally insane. I thought the Fight Club elements were a little weak, they felt like a pale imitation rather than an homage, but in the end, I liked his little riddle treasure hunt with his own Tyler Durden. I even will forgive the return to the jumpy slash blurry effect on his double when the two finally merge at the end as he accepts his darker half. I don’t see how he can legitimately get away with this one and I have a feeling that he will end up in Arkham before the season is out, but I’m willing to ride along with him for now to see where he goes. There are still a few loose threads that I hope get followed up on soon, there’s still the question of the whole Court of Owls and their secret feud with the Wayne family. Galavan’s end game seems to be to convince Bruce to hand over Wayne Enterprises, likely with an eye towards the recently revealed Indian Hill. 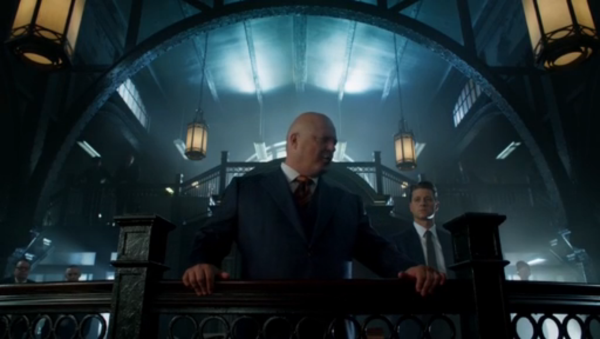 There’s also the little working in of martial law with the complete support of Police Captain Chiklis which gives me a little bit of pause to make me think that he might well end up siding with Galavan in the long run when it comes down to Galavan vs. Gordon. And this was an episode with no sign of Barbara, and while that is generally a good thing where I’m concerned, I’m morbidly curious as to what the show is actually going to give her for an end game, because nothing that I can see makes any sense whatsoever. We’ll just have to wait and see. Another very solid episode, we’re seeing this grow into something potentially pretty special. Cheers for the review.